Grooveability are a party band based in Sheffield who perform all the best pop, rock, soul, Motown, funk and indie hits. Drums, Bass, Guitar, Male Vocals, Female Vocals. Drums, Bass, Guitar, Keyboard, Male Vocals, Female Vocals. Drums, Bass, Guitar, Keyboard, Sax, Male Vocals, Female Vocals. Drums, Bass, Guitar, Keyboard, Sax, Trumpet, Female Vocals, Male Vocals, 2nd Female Vocals. Jazz Duo = Bass, Keyboard (The line up is flexible) The duo will perform up to 2x45 min sets over a three hour period. Guitar & Female Vocals. The duo will perform up to 2 x 45 minute sets of background music during a three hour period. Jazz Trio = Drums, Bass, Keyboard (The rnline up is flexible) The trio will perform up to 2x45 min sets over a three hour period. For larger events of up to 500 people we can provide a 5000 watt PA system with engineer. Jazz Quartet = Drums, Bass, Keyboard, Sax (The line up is flexible, alternatives are available) The band are experienced at performing Jazz Standards which creates a relaxed atmosphere for a meal or drinks reception. The quartet will perform up to 2x45 min sets over a three hour period. Grooveability is a great party band with a talent for choosing the right mix of hits for any event. Their repertoire spans the genres of funk, soul, Motown, pop, rock and indie music. This band has a versatile repertoire which can be adapted to suit your particular tastes. Their list of songs includes contemporary and classic hits from soul singers like Marvin Gaye to indie acts like the Arctic Monkeys. 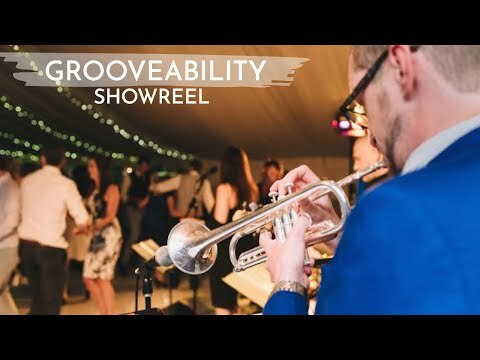 Grooveability are a flexible band with different options to suit your taste and budget. They can be booked as a 5-piece band up to a 9-piece band depending on your budget, space and the kind of sound you want. Grooveability can provide a DJ service to keep your guests fully entertained when the band is not performing live. Using a laptop, they can offer a huge amount of popular songs and are happy to take requests on the night. You can even make requests in advance and the band will create a bespoke playlist for you. Grooveability also offers an impressive jazz option, as a duo, trio or quartet. Their collection of jazz classics provides a sophisticated soundtrack for a drinks receptions or background dinner music. I am writing to thank you so much for playing in Music in Wanstead Park this year. I felt the whole event was a great success and your contribution was much appreciated. I hope you enjoyed playing and we will certainly consider booking you again if we run another event. Feedback from the public has been very positive. Thank you also for your professionalism in turning up on time and keeping to time, which helped the event run smoothly. 5 Piece Band (default): Drums, Bass, Guitar, Male Vocals, Female Vocals. 6 piece band : Drums, Bass, Guitar, Keyboard, Male Vocals, Female Vocals. 7 piece band: Drums, Bass, Guitar, Keyboard, Sax, Male Vocals, Female Vocals. 9 piece band: Drums, Bass, Guitar, Keyboard, Sax, Trumpet, Female Vocals, Male Vocals, 2nd Female Vocals. Hospitality/Artist Rider: Hot meal or buffet for all crew and personnel with soft drinks as required. Secure changing room.